The G80 was formerly known as the Hyundai Genesis but last year the Korean manufacturer has spun it off as it's own brand. Kind of like how Toyota has Lexus, and Nissan has Infiniti. The Genesis brand is new and unknown to most people. I have never seen one in person on the road but this week we get to try out the Genesis G80 and see if it's worth buying. Consumers can choose between a powerful 311 horsepower 3.8 litre V6 and an award-winning 420 horsepower 5.0 litre V8, both paired to an advanced 8-speed automatic transmission for optimal responsiveness and efficiency. All versions of G80 ride on a rigid platform featuring a fully independent multilink suspension, with large four-piston fixed front brake calipers for confidence inspiring stopping power. The available Genesis Adaptive Control Suspension can alter damping response based on road conditions or driver inputs, with Sport models featuring a firmer overall suspension calibration. 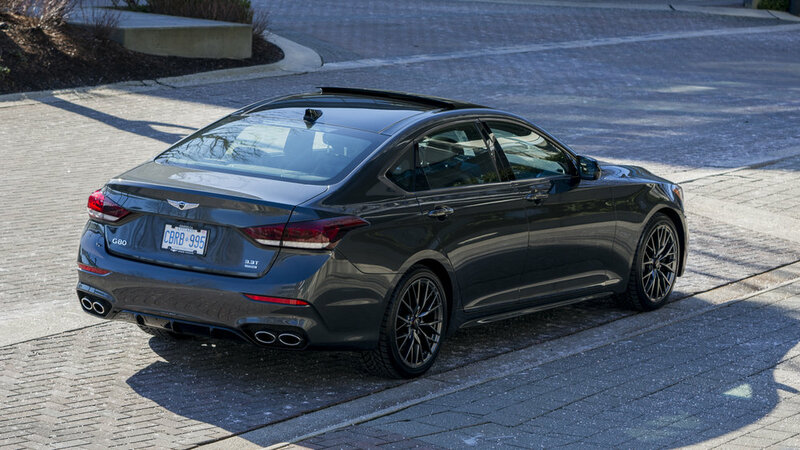 Disclosure: Genesis Canada & JS Auto provided me with the 2018 Genesis G80 for a week to test drive, and photograph. All photos in this blog post was taken by me. The braking is very respectable thanks to its wider tires but due to the car being a few hundred pounds heavier than its European competition it won't be able to stop as fast. Overall handling is okay but suffers a little due to it's heavy curb weight. Adaptive suspension system in the Sport version. One of the quietest luxury sedans I have ever been in. Heads Up Display is very crisp! Extremely good leg and head room in the rear! Class leading. Notably larger trunk than most vehicles in this segment. Genesis' G80 is a great car. Although the G80 Sport with the V6 Turbo is slower than the V8 version, I would still go for the Sport. The broad torque makes it far more fun to drive and the adaptive suspensions is something I enjoyed having. Genesis didn't clone the competition but focuses on performance, excellent ride, and very quiet cabin. The sport trim comes with carbon fiber trim to replace the wood trim. It is a wonderful car to drive daily. The ride is so smooth and comfortable. The only thing is most buyers in the luxury market tend to buy based off brand reputation. Most buyers will want a Benz or BMW logo so it can be a hard sell to new customers. Personally I would take this rather than paying 10-30 K more for something comparable. If you want all the luxury features at a much lower price point I would highly recommend taking a closer look at the Genesis G80. It is the best value in the luxury segment. The fit and finish rivals the European competition even though they don't have the long heritage yet.